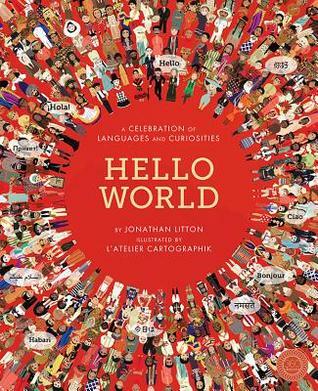 Learn to greet people around the globe in this interactive atlas of hellos. With more than 150 languages, flaps to guide you through pronunciations, and features on hieroglyphs, sign languages, and different writing systems, a world of exploration is at your fingertips. Jonathan Litton has written numerous children's books in prose and verse. He loves using his science background to write about sea creatures, space and saving the planet, but is also fond of penning stories about pirates, princesses and picnics. When not writing, he can usually be found on his bike. Founded by the two designers Alexandre Verhille & Sarah Tavernier, L'Atelier Cartographik is a creative studio which offers visual solutions in illustrated map, data-visualization and pop up engineering. This was a great little book that isn't so little. It shows you how to say hello in over 150 different languages and well both girls had so much fun with this! This book lets you know how to say each word which was a wonderful help! This would be a great book for everyone! Playing games on guessing what language your speaking. Great for classrooms to learn about different cultures.